Soccer Captains Armbands made from elasticated fabric. Colored armbands with a white center band and bold black text. Junior (4.5in) and senior (5in) sizes available. 5 colors to choose from. Stand out as the figurehead of the playing squad with this vibrantly colored soccer captains armband. Match your club colors and choose between red, black, blue, green and yellow variations. The fabric armbands feature a white band with eye-catching text printed in the center of them. Competitive soccer starts early and with youngsters just as keen to stamp their authority on the game as more seasoned players, our two sizes of captains armbands are an essential piece of equipment. Both our junior (4.5in) and senior (5in) sizes have been made with the same high quality levels of manufacturing. The shrink fit stretchy elasticated captains armbands have been designed to provide optimal mobility as well as comfort. The easy-fit soccer captains armband fits tightly to the arm of any skipper without becoming restrictive, staying rigidly in position without slipping down the arm while retaining full range of movement. Assert your authority on the pitch with these vividly colored soccer captain’s armbands. The elasticated armband is available in two sizes, offering a comfortable fit for skippers at both youth and senior levels of soccer. 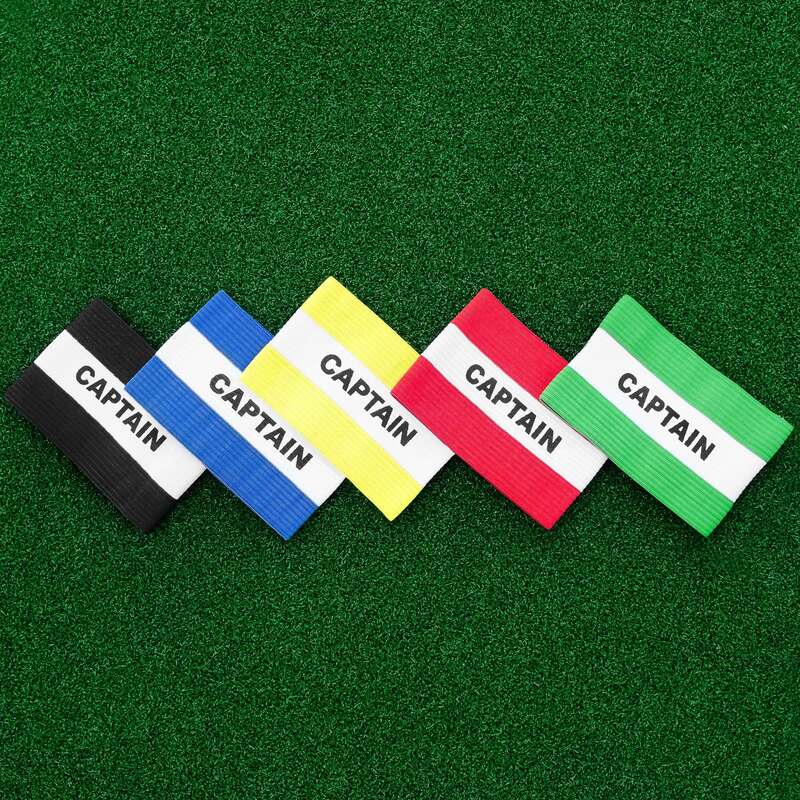 Our soccer armbands comprise of premium colored fabric either side of a white center band emblazoned with the text ‘CAPTAIN,’ ensuring that everyone on the pitch knows who is in charge. Match the armbands to your clubs colors by selection from black, blue, green, red or yellow options. Having been made from elasticated fabric, the easy-fit soccer armbands have been designed to comfortably lie on your arm without causing any obstructions. This professional manufacturing also enhances the durability of the armbands, with a sturdy fibre composition which curbs the risk of fraying and tearing following shoulder-to-shoulder impact and tough tackles. 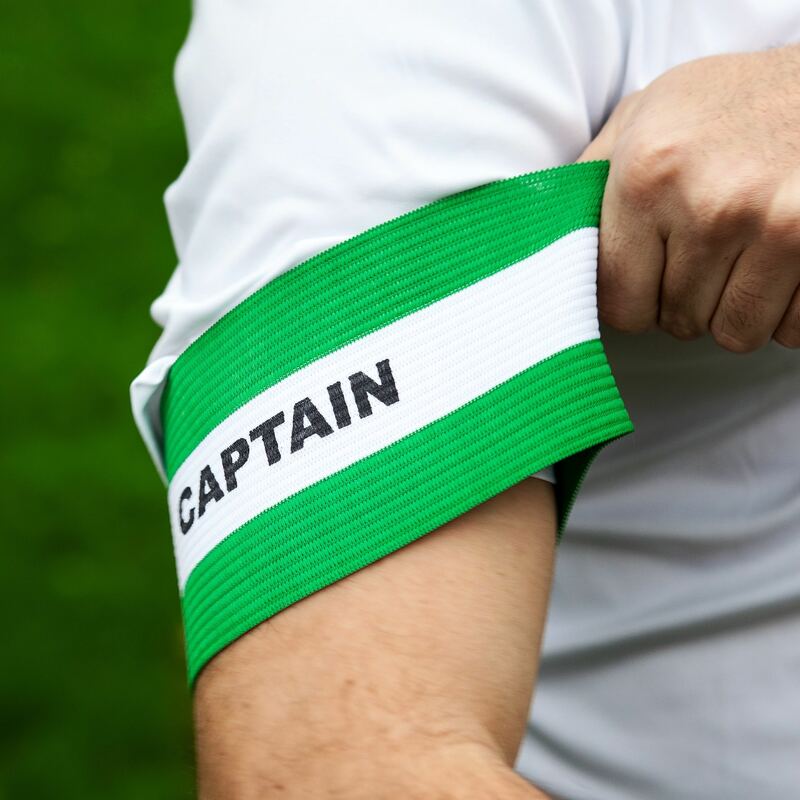 With two soccer captains armband sizes on offer, everyone from a junior team skipper to seasoned veteran can utilize these top of the range armbands. Select between a 4.5in or 5in armband and lead your team into battle. There are black, blue, green, red or yellow armbands on offer, allowing you to proudly display the chosen colors of the club you represent when you step onto the pitch. PLEASE NOTE - FORZA also stock All Black Respect armbands on our website.